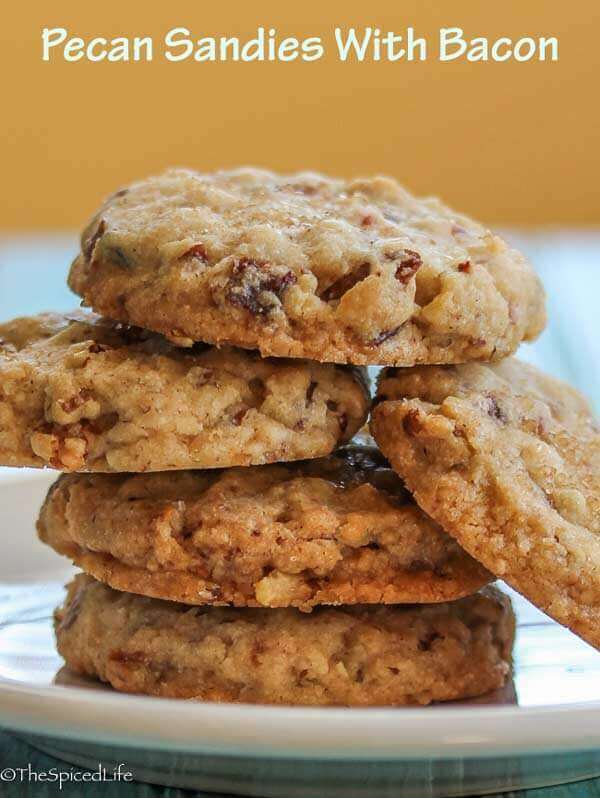 Pecan Sandies with Bacon are the perfect treat any time of year, but because they are from Zingerman’s Bakehouse , an Ann Arbor institution, they are especially tasty while watching Michigan basketball playing in the NCAA Tournament. Keep reading to check out another March Madness treat! Affiliate links have been used to link to items discussed in this post. As soon as the theme was chosen for March’s Creative Cookie Exchange (cookies for March Madness) I knew what I was making. Or more to the point, I knew where I was finding the recipe I was making, because Zingerman’s Bakehouse had just arrived in the mail, and as foodies all over America know, Zingerman’s is an Ann Arbor institution. And as longtime readers know, I bleed maize and blue, and no time more so than in March. 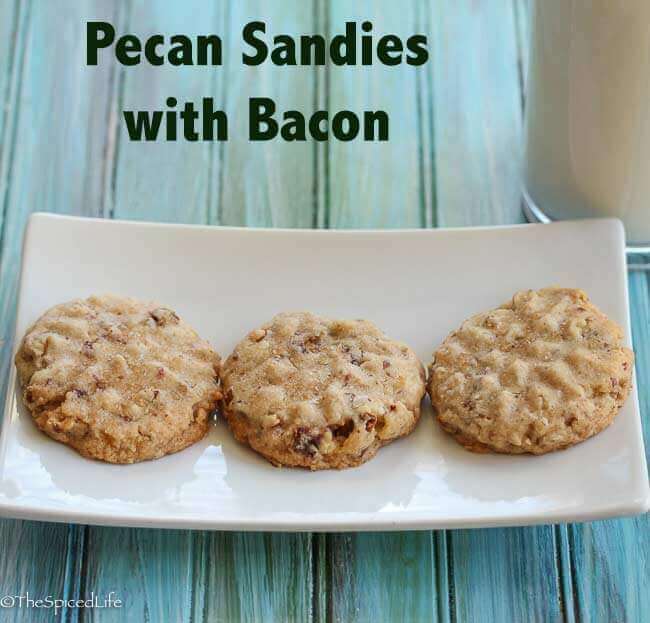 Knock on wood, these Pecan Sandies with Bacon have been good luck so far! For those who do not know, Zingerman’s started in 1982 as Zingerman’s Deli in Ann Arbor, Michigan (home of the University of Michigan, in case that isn’t clear, but not on the campus itself). It would be a lie to tell you I was a regular customer way back when–the truth is I never went once. It was not on campus, and there was a pretty stellar deli at the time right across from my dorm. And I was not really much of a foodie back then if I am being honest. Since then, Zingerman’s has expanded into an online business, the original deli, a baking and cooking school, and Zingerman’s Bakehouse. And I have indeed visited since my collegiate days, and in a word, YUM. So when the baking cookbook came out I knew I wanted it. Despite these delicious Pecan Sandies with Bacon, what Zingerman’s is really known for is its breads, and any bread baker will love this cookbook. Because it started as a Jewish Delicatessen (bacon cookies notwithstanding), there is an emphasis on challah, rye and Jewish rye breads as well as other artisanal Old World yeast breads. The fun spirit behind the organization really comes through in the book, and I loved reading about how all of the baked goods were created. I still want to make their Screaming O oatmeal cookies as well as their delicious looking coffee cake. There are some fun savory creations as well, such as Detroit style pizza, Cornish Beef Pasties and an Urfa chile based chili that I am excited to try. If you like baking cookbooks, I definitely recommend picking this one up. 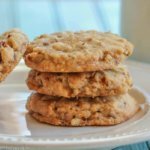 These Pecan Sandies with Bacon are exactly what they claim to be–crumbly shortbread sandies studded with chopped pecans and crumbled bacon. 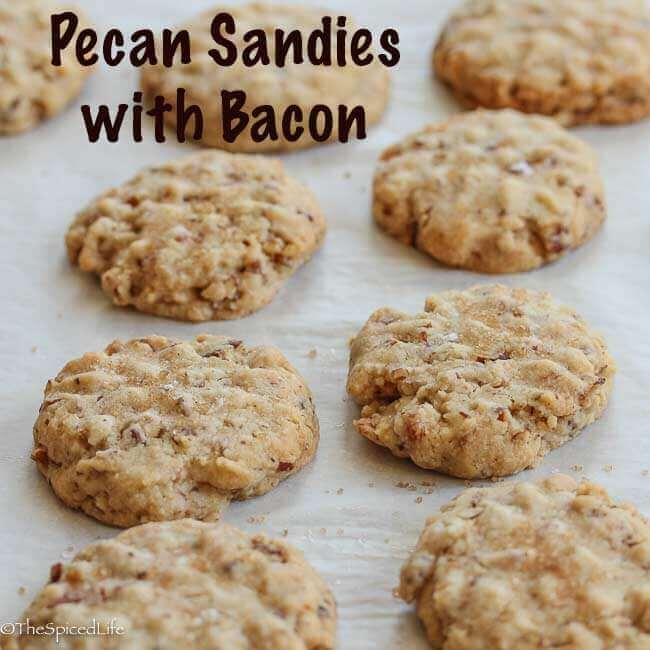 And the idea of adding bacon to pecan sandies? Genius. 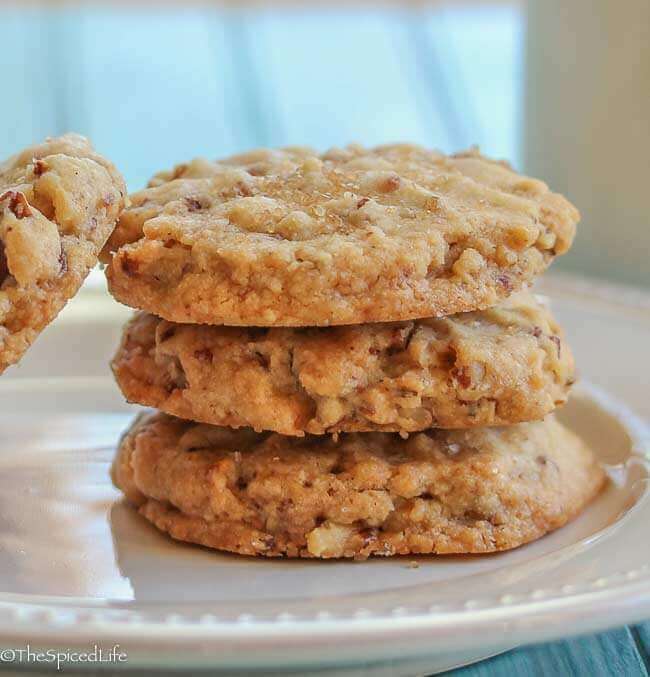 The salty savoriness of bacon makes the cookies that much more interesting, which is reinforced with the salty sweet toping of salt and a more flavorful sugar. 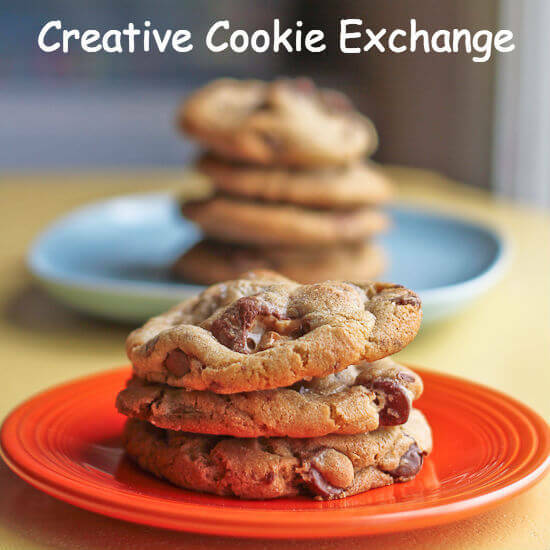 The cookies were a big hit in my house–my mom was here when I made them, and all five of us enjoyed them tremendously. We found the bacon flavor to be even more pronounced the next day, so this is definitely a good choice for baking ahead of time. Barely adapted from Amy Emberling and Frank Carollo. Preheat the oven to 325 F (315 F convection). Place the racks in the upper and lower thirds of the oven. Toast the pecans: Zingerman's prefers the oven at 325 F but I like doing it on the stovetop over medium low heat where I can move the pecans around and keep a close eye on them. However you do it, toast them until fragrant and slightly darker and then remove to a bowl to cool. Chop the pecans when they are cool. You want pieces close to the size of a pea. Cook the bacon until browned and crispy, once agin by whatever method you prefer. I cooked an entire package of thick cut bacon in a medium-low oven, and then set aside 3 slices for this recipe. Just make sure the bacon is crisp and not chewy. When the bacon cools chop it similarly to the pecans. Whisk the pinch of fine sea salt into the flour. Set aside. Cream the butter in a stand mixer. When it is creamy, scrape the sides and bottom of the bowl and add the sugar. Beat on medium speed until well incorporated. Scrape the sides and bottom of the bowl again, and then add the water and vanilla. Beat until well incorporated and then repeat scraping again. Add most of the flour and mix on low speed. When it is mostly incorporated, add the remaining flour as well as the chopped pecans and bacon. Mix on low speed until everything is evenly incorporated and coming together as a dough--do not over-mix. Line 2 cookie sheets with parchment paper. Scoop the dough out in balls, 12 cookies to a sheet. It is easiest to use a 1-ounce or 2-tablespoons cookie scoop. Each ball should be slightly flattened--Zingerman's uses their hands, but I chose to use one of my Nordic Ware Geo Cast Cookie Stamps dredged in flour--I knew the "stamp" would not show well, but it did give the cookie some rustic definition. After flattening the cookies, sprinkle them with Demerara or Turbinado sugar and a pinch of coarse or flaky sea salt. Bake the cookies for 16-18 minutes; if you are not using convection, rotate the sheets front to back and top to bottom halfway through the baking. The cookies will be golden on the bottom and just slightly browning on top when they are done. Let the cookies cool completely on the baking sheets. Like all shortbread type cookies, these will keep nicely in an airtight container. March means madness in my house–and having cookies to munch on while watching the basketball is crucial. We have a short list for you this month–maybe not all of us are basketball fiends?–but what we have is delicious so check it out! 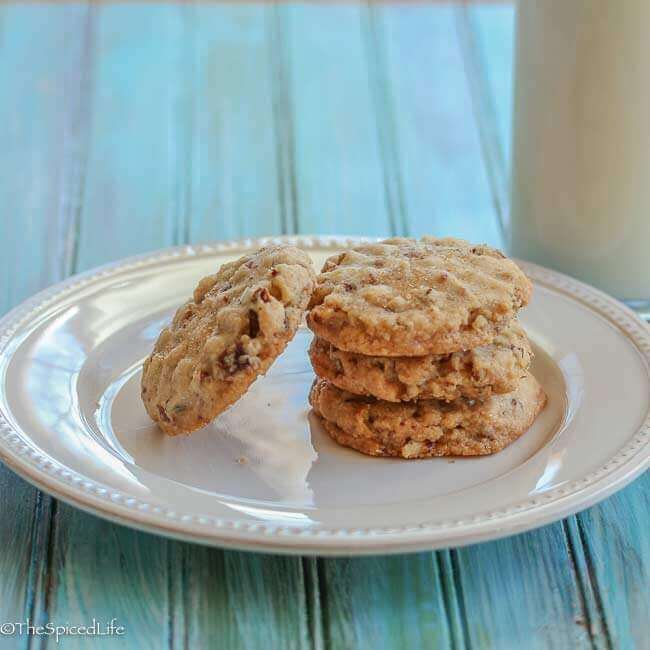 Hey cookie buddy – your pecan sandies with bacon sound amazing and the perfect accompaniment to a March Madness game. I have that Zingerman’s book on the top of my wishlist at the moment. These cookies were delicious, even after i skipped the bacon. My son made them and he is super proud of himself.